AS THE Coast swelters through a second summer heatwave the only thing most people want to do is cool off. The beaches the Coast is famous for have been packed with visitors and locals, and recently jellyfish, but there are other options. The region has some fantastic freshwater swimming holes, surrounded by shady forest, boasting cooler waters and (often) smaller crowds. But be careful. There are no lifeguards or surf lifesavers patrolling the freshwater creeks, dams and river and there are unique dangers such as submerged objects, lower buoyancy in freshwater, and the risk of cramping because of the lower water temperatures. If you are swimming in freshwater pools observe safety signs, and never jump straight in. But if you're cautious and making commonsense decisions, then freshwater swimming holes are the perfect solution to escape the summer heat. IF YOU live close to the coast and want to escape to the cool of the forest without going too far, head to Buderim Forest Park and hit the walking track to Serenity Falls. The swimming hole is at the base of the waterfall deep within the forest. Park the car at Quorn Cl, Buderim, for a short walk, or Harry's Ln if you're keen for a creek-side scramble to the swimming hole. NESTLED high in the hills near Montville, this swimming hole is tucked at the bottom of one waterfall, and the top of another in Kondalilla National Park. It's a short walk from the car park at the end of Kondalilla Falls Rd (off Montville-Mapleton Rd, Flaxton) to the swimming hole, which is located at the top of the ridge before the circuit hiking track dives into the gorge (don't make the mistake of hiking to the bottom if you're only after a swim!). There's plenty of shade, a few rocks to sunbathe on, and a fantastic view west across the valley towards Kenilworth and Conondale National Park. ANOTHER hinterland gem, Gardners Falls - just outside Maleny - is one of the Sunshine Coast's most popular freshwater swim spots. 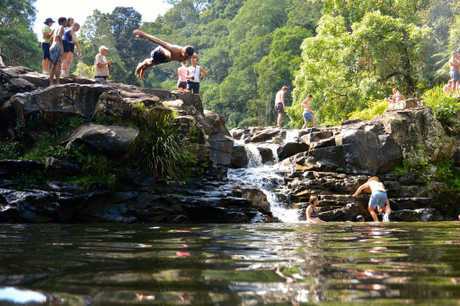 Adventurous types can usually be seen jumping from rocks or rope swings into the natural rock pool on Obi Obi Creek. Park at the end of Obi Lane South and follow the track, but be warned, you can probably expect a crowd during the height of summer. Rope diving at Gardners Falls: People diving from a rope at Gardners Falls rock pool. IF YOU really want to escape the crowds head for Booloumba Falls in Conondale National Park. Located on the western edge of the hinterland near Kenilworth, the park is a great place to escape the summer crowds, and heat. Booloumba Falls is a 3km return walk from the Booloumba Falls car park. Alternatively check out Artists Cascades. It's a 10.6km return hike from the Booloumba Creek day-use area, but it's worth it. Check out the Parks website for more information. NORTH of Noosa in Cooloola Recreation Area, Harry's Hut day use area sits on the Upper Noosa River north of Lake Cootharaba, and makes for another great, out-of-the-way swim spot. Accessible by kayak, canoe, 4WD or on foot, it's out of the way, and relatively tranquil as a result. Find out how to get there here. IF YOU'RE not into hiking and don't want to go too far off the beaten track, Ewan Maddock Dam is a good option for the whole family. Just off Steve Irwin Way at Mooloolah, it's open to swimming, fishing and canoeing. It's also got some great tracks for walking and cycling, as well as amenities. 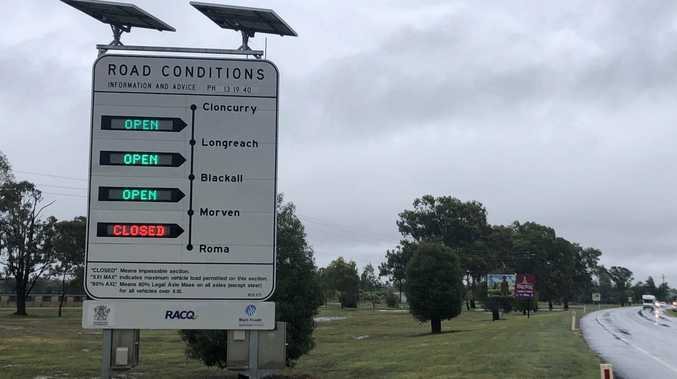 Check Seqwater's website for any access changes before going.